Feel the Love This Friday! Northwest Lovefest began in the same Seattle neighborhood as the Brown Paper Tickets flagship office. It’s a community-based music and arts festival that began in 2010. What originally started as a celebration of the artistic talent residing in this eclectic neighborhood has now expanded its vision and scope to include like-minded talent from throughout the Northwest. This year’s festival will take place on Saturday, June 30 and Sunday, July 1 in Magnuson Park. Preview shows will take place in the months leading up to the festival. These shows will give folks a taste of the incredible musical talent that will be hitting LoveFest stages this summer. 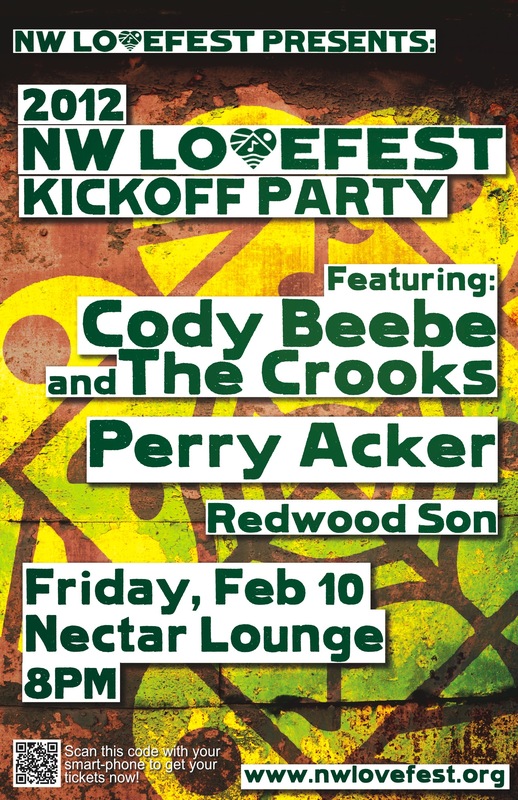 The kickoff show will take place at Nectar Lounge, this Friday, February 10 and will feature live performances from Cody Beebe and the Crooks, Perry Acker and Redwood Son. You can pick up advanced tickets right over here. Get out to Nectar and support Northwest LoveFest, a true community, music and arts festival – powered by love! Tags: Cody Beebe and the Crooks, Fremont, Magnuson Park, Music Festival, Nectar Lounge, NW Lovefest, Perry Acker, Redwood Son, Seattle, TerraPass. Through the tiny window in the Event Promotions office, a ray of light penetrates the Brown Paper Tickets basement offices. It hurts my eyes to look at. It’s something that I haven’t seen for many months. What could it be? I think it’s sunshine! That tells me one thing, summer is coming. Time to break out the sunglasses and the shorts and get out there and do some outdoor living. The sunshine also heralds the beginning of summer music festival season and, let me tell you, we’re ticketing tons of great festivals all over the country. From classical concerts to jam bands to indie rock, it’s all represented here and while my list is probably far from complete, I’ve included some of the festivals that caught my eye. Tags: 4 Peaks Music Festival, AB & Coconut Brown, Acorn Project, Armcannon, Asher Fulero, brentalfloss, Buster Blue, Cash'd Out, Cat Power, Chromeo, Conscious Culture Festival, Deer Tick, Deerhunter, Del The Funky Homosapien, Delta Spirit, DJ Spydre Murphy, Doe Bay Fest, Dwayne Morgan, Elephant Revival, Everyday Prophets, FBC All-Stars, Founders Brewing Company, Founders Fest, Galactic, Gem State Jam Music Festival, Huckle, Jamioe's Jass Band, Justin Plaskett, Justin Townes Earle, Kalama Brothers, Kona Brewing Company, Leon Russell, Liquid Aloha, LouFest Music Festival, Manifest, Maria Taylor, MegaRan, Metroid Metal, Moon Mountain Ramblers, Murder By Death, Music Festival, My Goodness, N'Dambi, Navasha Daya, Nerdapalooza, New Monsoon, Old Death Whisper, Old Idaho Penitentiary, Olympic Music Festival, One Drop, Patty Blee, Poor Man's Whiskey, Prophets Fest, Roy Ayers, Rubblebucket, Sharon Little, Silvana, Simpkin, Slack Fest, Southern Shore Music Festival, Springfield Indie Soul Festival, Steppin' In It, Stillaguamish River, Sugarcane String Band, Taalam Acey, Taarka, Tapwater, Ten Mile Tide, Terrapin Flyer featuring Melvin Seals, The American Girls, The Dawg Daze of Summer Festival at Lake Paradise Resort, The Dirty Heads, The Epilogues, The Golden Blondes, The Hold Steady, The Low Anthem, The Maldives, The Moondoggies, The OneUps, The Protomen, The Ragbirds, The Roots, The Sword, TV On the Radio, Ume, Wasabi Collective, Westword Music Showcase, Whalebones, Wild Rye, Yo La Tengo, Young The Giant.